Cayenne: I tried to drop the hammer, but couldn't. My hands were gripping the hammer so tightly that I could hear my bones creaking, as if any more pressure would cause them to shatter. Cayenne: My arm and hand locked in that position for what seemed like an eternity. An eternity of pain and anticipation. Then finally, my hand came crashing down on the rusted tool. It was like I could see the swing in slow motion. Time seemed to slow down, and get slowed and slower as the hammer got closer and closer to the rusted tool. Cayenne: When the hammer struck the tool, my entire world became agony. It was as if I were the tool, and had just been struck by my own hammer. The pain was so intense I fell to the ground and was unable to get up. And as I fell, a hellish scream filled my ears. I didn't know where that scream came from, but I knew that nothing good could have made it. Cayenne: It took three minutes for the pain to lessen to the point where I could stand up again, and when I did I took a look at my surroundings. Cayenne: It can't be! The anvil... the furnace... my tools... they're gone! Cayenne: They were all ruined. The entire area looked as if a bomb had gone off. The wagon was broken and the magic coal had spilled out all across the ground. The only thing intact and unmarred was my hammer, still in my hand. The red flecks and bands seemed to glow stronger than they did before. Cayenne: Was the hammer haunted? I had heard of a dark cult in my earlier days called the Bonemasons, who were rumored to have performed hellish rituals and sacrifices to their unknown god in return for artifacts of incredible power. Was this hammer one of those very artifacts? It had to be. Cayenne: That must be why the marking on the bottom of the hammer had been scratched off! The Bonemasons must have had to sell the hammer for some reason and they didn't want it traced back to them. Which was a smart plan, because I was very unhappy at the time and would have attempted to find whoever was responsible for the damage the hammer had caused my possessions. Cayenne: I stored the hammer in my backpack, because I didn't want to be tempted to hit anything else with it and I knew if the hammer was somewhere I could see it I would want to, despite the danger and destruction it wielded. Cayenne: I fixed the wagon and loaded the magic coal back up and continued on my way. I made it to Lionel's shop much later in the night and unloaded the wagon and magic coal for him and placed the bag containing his change in his safe, which I knew the combination to because I had been tasked with guarding it a while back. Cayenne: After that I headed home and went to bed, determined to forget all about the Bonemason's hammer and to get a good night's sleep in order to be ready for another productive day of work. Cayenne: I had only been asleep for about an hour before being woken up by a scratching sound somewhere in my room. I pretended to still be asleep as I listened to the sound and tried to locate where it was coming from. Cayenne: It was coming from my backpack. The hammer! The hammer was trying to get out of my backpack! Cayenne: I sat up and watched as the hammer rose from my backpack and floated in the air. I couldn't make out the metal head or wooden handle at this point, as the entire was glowing a dark, sinister red. The color of blood. Cayenne: The hammer turned left and right in the air, as if searching for something. Finally, I felt its gaze lock on me and it stopped moving. It had been looking for me. 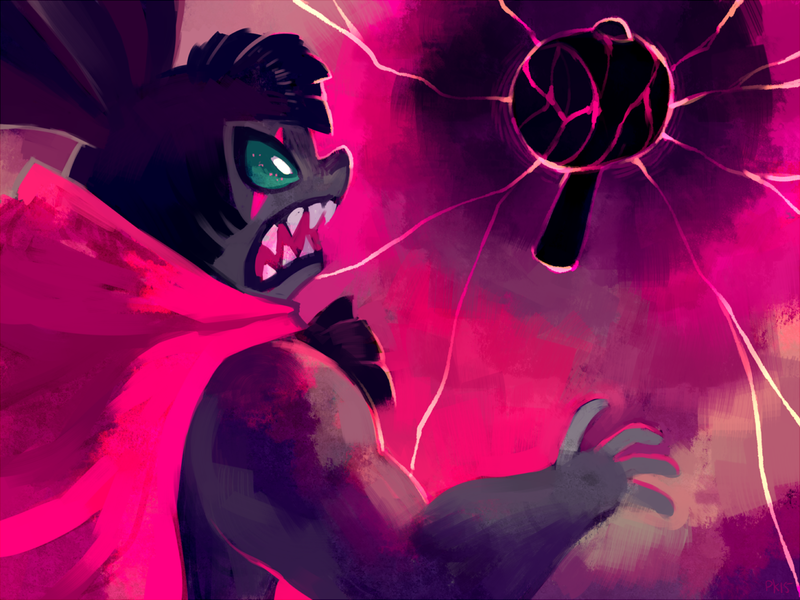 Cayenne: Who are you, hammer? Cayenne: What do you want of me? Cayenne: At this point, the hammer flew through the air and struck me in the side, shattering a few ribs. I tried to scream but the hammer hit me in the side of the head, and knocked me to the ground. Cayenne: The hammer hit me again in the side, causing me to roll across the ground onto my back. I could feel every broken rib, and my skull felt as if it had been fractured. The hand I held the hammer with earlier that night appeared blackened and burned, and I couldn't get it to move. Cayenne: I knew for sure then that the hammer was the work of the Bonemasons, and that Stan, the merchant at the flea market who sold the hammer to me, was a member of that cult. He obviously went from city to city, selling the hammer to unsuspecting individuals as sacrifices to their dark, unknown god in order to keep their artifacts powerful. Cayenne: And I was his latest victim. Cayenne: The hammer appeared in front of me, right above my face, and it began to rise, slowly. I knew it was going to kill me. It was going to destroy my face as it had destroyed my furnace and forge and all my tools earlier. Cayenne: I was to be a sacrifice for the hammer... the Blood Hammer. Cayenne: I was panicking and trying to escape, but the broken ribs and useless arm didn't help, not to mention my head injury was making it very difficult to concentrate. Cayenne: I watched the hammer rise higher and higher, and then I noticed something. The scratched-out name on the bottom of the handle! That must be the creator! If I could only make out the name, I could control it! Cayenne: The hammer came to a standstill, finally at its apex. It laughed maniacally and evilly, and it whispered to me. Hammer: Do you have any last words, mortal, before you are sacrificed in the name of the Blood Hammer? Cayenne: And I did. I had figured it out. I smiled despite all my injuries and pain and spoke to the hammer. Cayenne: Yes, hammer, I do. My last word is... NATS! Cayenne: The hammer shrieked as if it were in pain and flew across the room, crashing into the walls but not into me. The hellish scream from earlier pierced my ears with such intensity I thought I was going to faint, then it stopped. The hammer stopped glowing and moving, and fell to the floor to my side. Cayenne: I had realized in the moments before my possible death that the reason I couldn't read the name on the bottom of the handle was not because it was scratched out, but because I was trying to read the letters normally. But the letters weren't normal, they were backwards! Stan wasn't the creator's name, or the guy who sold it to me. It was Nats! Cayenne: I managed to pick myself up and sat down on my bed. I was overcome then with a great weariness, as I had just done battle with an artifact of incredible evil and had come out victorious, but I knew I had one thing left to do. Cayenne: I put the hammer in my backpack and weighted it down with stones outside my house, which was on the beach. After I had enough stones in the backpack to be sure that the backpack would never be able to float in water, I took one of the many rafts I owned and paddled out into the sea. Cayenne: When the shore was no longer visible, I knew it was time. The water was deep enough, here. Deep enough so that when I dropped the backpack containing the hammer into the water, it would sink to the bottom and never be found by anyone again. Cayenne: I threw the backpack out into the sea as hard as I could, and when it touched the water I heard a hissing noise, as if something extremely hot had just been plunged into cold water. It was the hammer, obviously, being extinguished and suppressed. Cayenne: I made my way back home and got a good night's sleep. The next morning, I had a friend send word to Lionel that I had become injured in a scuffle with some ruffians, and that although I fought them off and escaped with both Lionel's money and product, I was injured and would not be able to work until I was healed. Cayenne: Lionel understood, and I spent a paranoia-filled month at home. What if someone found the blood hammer, despite all my precautions in throwing it out to sea? What if the hammer came back? My worries amounted to nothing though, as at the end of the month I was back to normal and the hammer hadn't made another appearance. I was safe, and so was the world. Cayenne: I had learned that the flea market had moved on the day after I visited it, which was no surprise to me. The flea market is always moving, and I was sure that I would see it again one day. Cayenne: When it came back to our city, I would go visit it again. I would look through the tents at night, as I did before. I would look for Stan, and his collection of wares. Cayenne: And if I found him, I would see to it that every one of my questions was answered. Cayenne: I would see to it that he never sold another hammer again. Cayenne: That he never sold another Blood Hammer again. Cayenne: Or my name wasn't Cayenne. Cayenne: Based on a true story. Calliope: I believe I lack the proper vocabulary for an accurate response. Cayenne: Too terrified to speak, huh? Calliope: In a way, yes. Cayenne: Hey! The sirens have turned off! We can go back to the city, now. Cayenne: Let's get out of this dump. Calliope: I think I'll stay here for a bit. I want to sit here and think for a while. By myself. Cayenne: Suit yourself. I'm outta here.